Surfing doesn’t stop once you have got to your feet! Once you have got getting to your feet on the surfboard there are plenty of exciting things to move onto. All lessons are 2 hours long and there can be up to 8 people with 1 instructor. In improver group lessons the focus has generally moved off getting to your feet to board control. 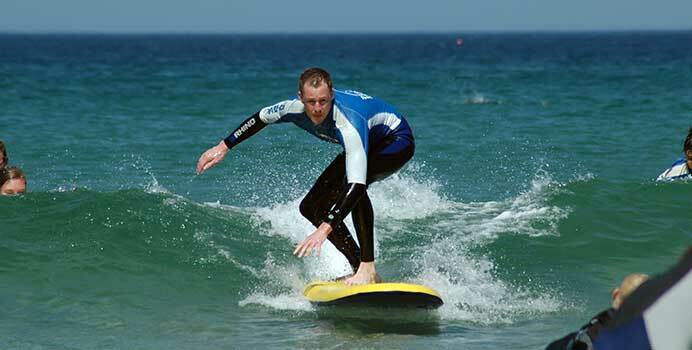 The formats of the lessons are flexible to the surfing experiences and lessons that people have been having with us at Fistral Beach Surf School. All instructors are passionate about making sure you get as much feedback as you can in their lessons, all instructors are qualified beach lifeguards and surf instructors. Guaranteed first class coaching available throughout the year!